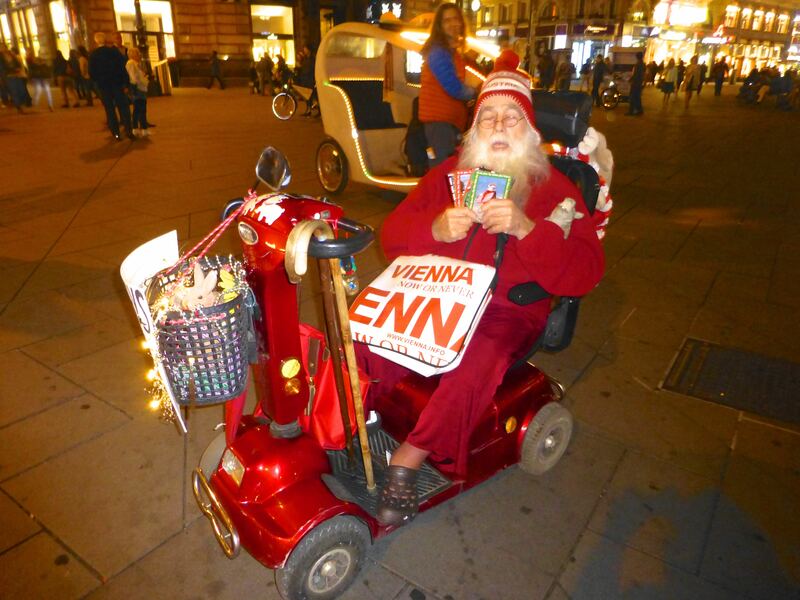 In October of this year, walking around after a long week’s work in Vienna, the sight of Santa in a motorized scooter in front of St. Stephen’s Cathedral brought a smile to my face and delight to my heart. Who was this guy? And what in the world was he doing? Approaching the man, I found him quite jolly, and happy to share his story with me. While insisting that his real name is St. Niklaus, he told me that over the past 50 years he has traveled in 81 countries on six continents, hitchhiking over one million miles. He regaled me with stories, joy and laughter, and it warmed my heart to learn that this man is devoted to making the world a better place. Since he is a global nomad and shares our Cultural Detective vision, I thought you might enjoy his story. Maybe you’ve even met this unique gentleman yourself sometime during his world travels. Santa, or Michael Klein (I learned his real name online), has been traveling the world since he was 29. He was born in Maryland USA, one of 14 children. Michael practiced being Santa ever since he was in elementary school; he loved sharing gifts and candy, and making people laugh. The past few years he has lived in Vienna, after a heart attack, health concerns, and resulting money woes paused his wandering ways. When I met him he was selling postcards of himself in various global locations. I bought one of him with a surfboard in Hawaii, as it reminded me of home in Mexico. Michael doesn’t speak German, at least not very well, but he sure does seem to fully enjoy life in Austria. Santa urged me to check him out on the Internet, and there I found a campy Advent calendar in video format, with one two-minute episode for each of the first 24 days of December. I embed the first episode below; the link above will take you to all the rest. The calendar was produced by the Vienna Tourist Bureau, so you get to experience some of the sights, sounds and tastes of Wien as you get to know St. Niklaus. What I most enjoy is hearing his stories: what motivated him to pursue his nomadic ways, his value on freedom, how he financed his way around the world, the people he met, the experiences he had, and what his journeys have taught him. How about sharing a story describing some of the quirky, unique people you’ve met during your journeys around the globe? Tell us about those wonderful people who remind us that it is our differences that bring some of the greatest joy to our everyday lives! This entry was posted in Commentary and tagged Cultural Detective, hitchhiking, intercultural competence, multicultural society, Saint Nick, Saint Niklaus, Santa Claus, St. Stephen's, Vienna, Wien, world travel by Dianne Hofner Saphiere. Bookmark the permalink. What a joyful story Dianne. It reminds me to stop and talk to people during my travels. This does not come naturally for an introvert, but it always results in rewarding conversations. I’m quite an introvert, too, Donna, but when traveling alone it’s easier to reach out, I find. When I’m with a friend or partner, I realize I don’t speak to others as much. Hugs your way!